The outcome for 2014/15 represents a tenth successive surplus for the College and reflects the strategy to build new sources of operating income. Total income from all activities including donations was £12.45m. Expenditure, at £10.81m, reflected our typical composition of costs, with increased expenditure for the Kitchen renovations and other investment in infrastructure. New capital donations of £2.2m are to be transferred to the endowment. Overall expenditure has been carefully managed. The critical test for Balliol’s financial stability is the relationship between the patterns of income and expenditure, and these are currently in satisfactory balance. The figures in the charts below are extracted from the College’s statutory audited financial statements for the year 2014/15, which were approved by Governing Body on 7 December 2015. They show that the ongoing generous support of Balliol’s donors is crucial if the College is to continue to build its endowment whilst achieving many of its academic and operational objectives now and in the future. The value of the College’s endowment funds stood at £91.9m as at 31 July 2015, up £11.7m from one year ago on a like-for-like basis. Over the 12 months to 31 July 2015 the investments performed well in excess of benchmark returns, with a total return after expenses of 12.3%. Several of our holdings made positive contributions. Our diversified asset managers, Oxford University Endowment Management and Partners Capital, provided solid returns with reduced market risks. Private equity holdings have also been a key feature of the College’s investment returns in recent years. As these positions are continuing to mature we anticipate further positive returns in the coming years. Our property investments in the Charities Property Fund returned 15.6% and as the College has no external property portfolio, this holding provides us with exposure to this asset class. Balliol’s exposure to US and developed market equities, and a modest exposure to unhedged US dollar positions, also added to the investment performance. 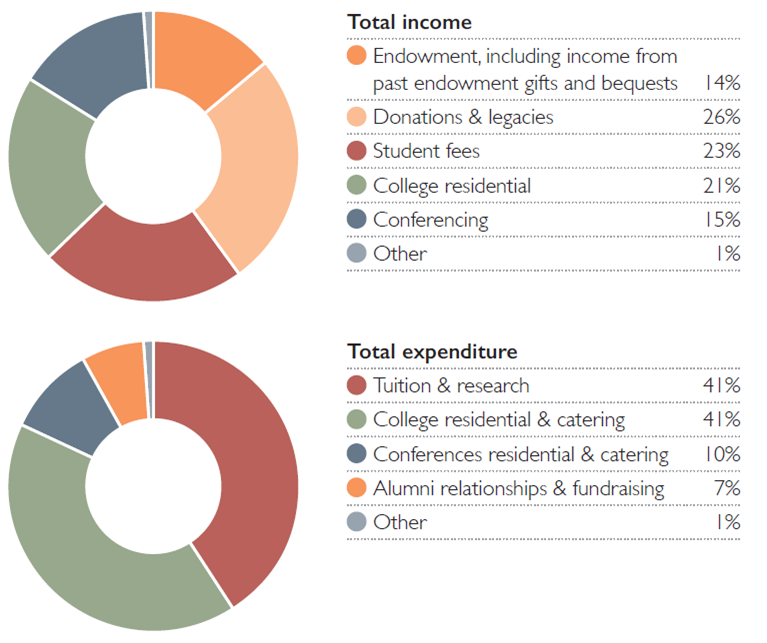 The improvements in Balliol’s underlying financial condition have provided scope to be more prudent with expenditure taken from the endowment, and the College has reduced its spending rule, based on a four-year rolling average of endowment value, to a drawdown of 3.75%. We believe this will promote sustainability and intergenerational equity for future students and Fellows. 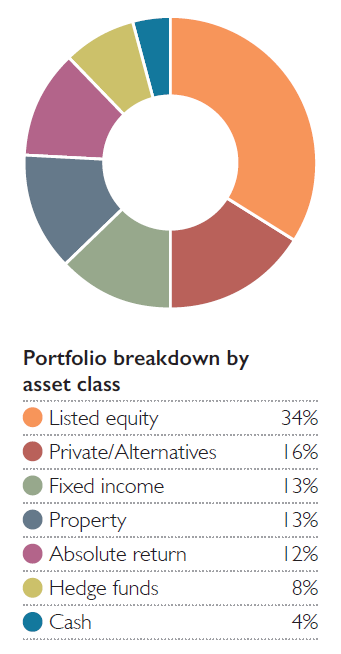 In 2014 Balliol commissioned a review of its investment strategy, portfolio allocation, and fund manager performance by Lane Clark & Peacock, a leading charity investment consulting firm. Their advice was to continue our risk-averse posture, and to build further the College’s exposure to property, diversified assets and absolute return positions. The Investment Committee believes that an independent review of College’s investment policy will promote informed decisions when investing Balliol’s assets, and plans to hold such reviews every 3–4 years. Over the last decade the College has invested gifts and bequests from Old Members towards capital projects and refurbishments which provide for the future of our academic community. Increasingly, the College has sought to make the most of these investments, especially during the long vacation, by growing our income from conferences, functions and banqueting. During the last ten years, these new sources of income have increased by over 400%. In 2014 a major refurbishment was undertaken of the College Kitchen, last upgraded during the 1960s, a project completed on time and to our budget of £3.8m. This investment has delivered a modern facility for the College that will allow us to serve our students, Fellows and Old Members well for many decades, and which has become a safer, more productive and creative environment. The project has reduced cooking times, has improved efficiency and consistency when cooking for large groups of people, and has provided a lift for disabled access into the Hall. All surplus income from conferences and banqueting is invested for the benefit of our students and Fellows, making the most of support from Old Members whose gifts have helped us to maintain and improve our estates and facilities. Total income form conferences, functions and entrance charges has risen by 415% over the past 10 years.